Babblings of a Mommy: Finding The Best Fit For Your Children's Shoes. Finding The Best Fit For Your Children's Shoes. Every child's feet are as unique as his or her personality. As a mother I know this all too well since my daughter is flat footed. That means that we have to be extremely selective when it comes to her footwear. Sometimes choosing the appropriate shoe for our children can be even more frustrating than choosing our own. We often have to use our own judgement to determine if it’s the right fit for their shape and size. To aid us in our search, here is a Measure & Fit checklist to run through next time we’re shoe shopping for our kids. Help your child put the shoes on and check they are fastened effectively. Feel for the end of your child's longest toe - getting them to wiggle their toes may help. Check there is sufficient growing room. Half an inch of growing room is sufficient for most styles. Feel along the inside and outside of the shoe with your hand. There should be no pressure or pinching at the sides. Your child should be able to wiggle their little toe. Pull your fingers across the front of the shoe. There should be sufficient depth for comfort. The leather should ripple, not pleat or crease. Pull your fingers across the front of the shoe. Feel around the top edge of the shoe. There should be no gaps and the leather shouldn't rest against the ankle bone unless it is soft and padded. Sit your child down and lift one foot. Pull down gently on the back of the shoe. Make sure that it grips the heel well. Repeat with the other foot. Now ask your child to walk in their shoes. Make sure that they are able to walk easily and naturally. Check that the shoes grip when walking. The shoes should not gape excessively at the sides. Remember the quality of shoe is just as important as the fit. 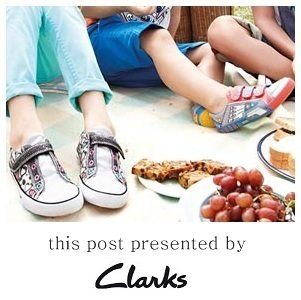 With more than 180 years of experience, the kids shoes by Clarks offer an exceptional assortment of shoes which guarantee the best possible fit for every step of your child's development.